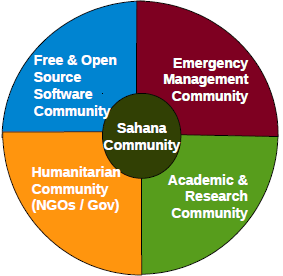 The Sahana ecosystem essentially comprise a community of practice; namely, the group of individuals sharing a common interest in investing their resources towards developing information systems for disaster mitigation, preparedness, response, and recovery phases. The power of the community of practice approach is one of the main reasons for the Philippines community was able to get Sahana community’s assistance to fulfil their humanitarian operations information sharing and publishing needs. Sahana members could be identified as “technology stewards.” (Terminology adopted from communities of practice theory. SLIDES presented. – were predominantly focused how the community has developed an essential public good that has been used in several major catastrophes, across the globe, and continues to exist. Just alone in the Philippines there are three deployments of Sahana. There is potential for Sahana to do more in the Philippines with a local presence. Thereby, build capacity to improve local Sahana community to self sustain their deployments. The workshop was hosted by Viettel and co-organized ITU ASP Centre of Excellence. 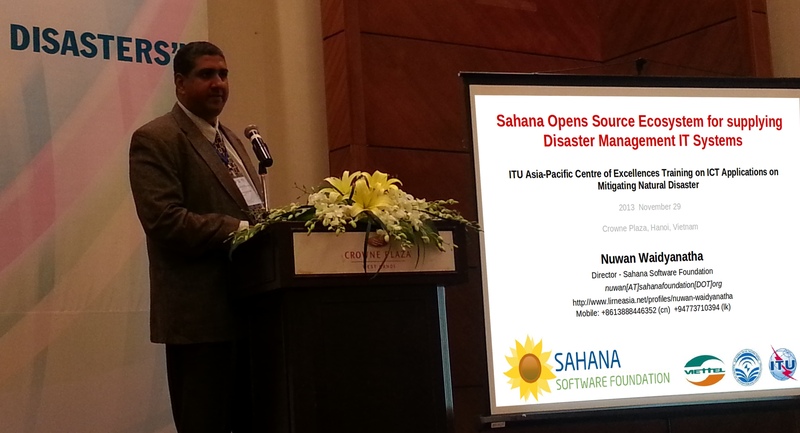 The workshop took place in Hanoi, Vietnam, 28-29 November 2014. The audience were predominantly IT staff from various government agencies. The talks were mainly from foreign experts.